San Francisco’s commercial real estate market continues to be fueled by the tech industry, but a range of factors indicate a cooling trend could be on the horizon. Just when it seemed 3 million square feet of deliverable office construction was more than enough to meet 2017’s demand and slow the rate of rental escalations, the market tightened again. Tech companies scooped up major blocks of space (50,000+ square feet) at a rapid rate. Single-digit vacancy rates and historically-high rental rates in the central business district submarkets will prevail until additional supply becomes available in the next two to three years, according to the San Francisco Business Times, a metropolitan business journal. 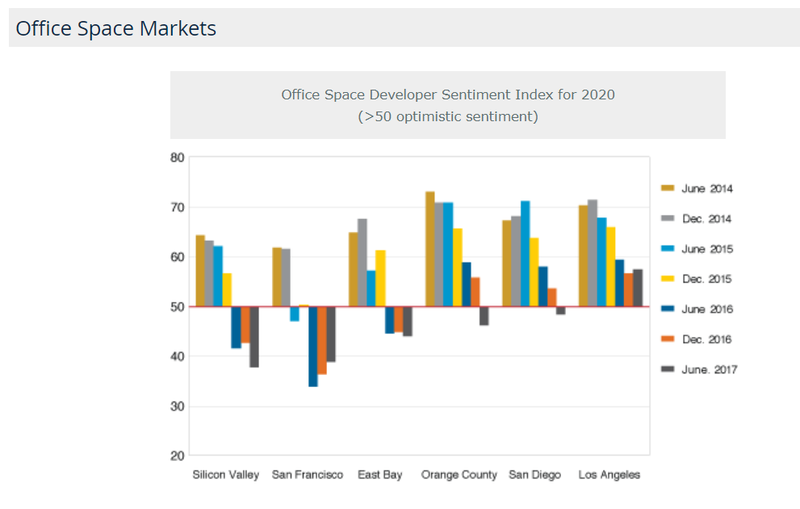 Traditional office tenants must seek non-SF-based opportunities or make difficult decisions to shrink their footprints to maintain reasonable occupancy costs as rents are still too steep for most non-tech business models. As a result, landlords with <50,000 square feet are struggling to lease vacant space, offering increased concessions to benefit smaller tenants. As long as the tech sector is not hit hard by market corrections, traditional space users could be squeezed into those smaller footprints, or seek other locations. San Francisco-based TRI Commercial/CORFAC International is cautioning office clients against long-term lease commitments to avoid being locked-in above future market rents. A base term of three-to-five years, coupled with an option or two to renew the term to maintain control, is the prudent path through 2020. Certain retail brands are opening small footprint concepts in gentrifying neighborhoods. In addition, recent statistics suggest rates for the Big Box retailers are falling while, at the same time, rates for upscale space is rapidly escalating, at least in the more chic urban enclaves. However, recent rate softening can work in some tenants’ favor. Assuming this retail modality is fairly constant, some good long-term opportunities exist, and it may make sense to secure some of those deals promptly. San Francisco industrial space has quietly evaporated over the past 20 years, replaced by high-rise residential, sports venues, and office developments. This out-migration is primarily focused on the East Bay and California’s Central Valley, where less-expensive land exists in abundance for large warehouse/distribution structures and truck-staging capabilities. 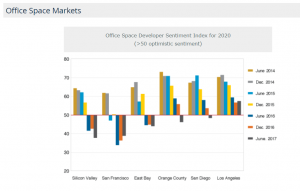 As favorable employment trends continue, the commercial real estate segment of the San Francisco economy remains a bit of a wild card for the overall marketplace. San Francisco currently enjoys historically low unemployment (under 3%), but the largest tech companies must compete by attracting qualified talent to fill the millions of square feet they’ve recently acquired. Another emerging reality is the potential for a slowing pace of tech job growth over the next decade and its possible impact on the market. Some experts are looking ahead and asking rhetorically, how sustainable will big tech be in 10 years? Can tech firms find qualified talent — at reasonable salary levels — given the extremely high cost of living in the San Francisco Bay Area? In fact, a LinkedIn research report from June 2017 cited statistics a 17% decline in workers moving to the region in the first six months of 2017. But, other cities, such as Seattle, experienced a 2% net worker increase over the same period. If the 10-year historical norms prevail with respect to commercial real estate recession recoveries, and no unforeseen external crisis emerges, San Francisco’s market should begin to rebalance in the next 18-24 months. However, this rebalancing will be mild and nothing similar to other market scenarios of the early 2000s. For instance, immediately after the dot.com bust of 2000, office leasing rates fell nearly 40%. This scenario is unlikely to occur over the next several years, primarily because most tech companies that survived economic downturn are firmly established enterprises and enjoy relatively-stable operational platforms. Yet, some decline in commercial real estate valuations is still likely to occur before 2020, since markets are cyclical, leasing rates can’t climb at their current pace indefinitely, and borrowing rates have begun to slowly increase.